It came to me as a complete surprise that the BBC documentary Are Our Kids Tough Enough? Chinese School got so much attention, and the debate over which is better, the Chinese way or the British way, actually got so heated up. So I just spent 2 hours watching it on Youtube and here’s what I think. First of all, I’d say the heated debate and all the furious comments on which way of teaching is better are mostly not based on the video itself. Because what the documentary shows is not a meaningful comparison. All the Chinese teachers simply failed miserably in managing their classes from the very beginning, due largely to, in my humble opinion, cultural conflict and language barrier. So I’ll base my comment on the program and maybe comment on the debate over this program in a separate post. I don’t know who organized this. I think it’s a fantastic idea in terms of cultural exchange. But if the goal is to compare the Chinese way of teaching to the British way of teaching, it cannot be taken seriously. Teaching involves extensive interaction between the teachers and the students. Language barrier and cultural difference cannot be overlooked. Stories of foreign teachers got frustrated in Chinese classes because Chinese students were inactive have been around since 20+ years now. Why should we expect the Chinese teachers not to be shocked in a British school? This cultural shock should be expected and extra time should be planned for both the teachers and the students to adapt. The other obvious defect in the design of this experiment is, knowing that the British students are 3 years behind their peers in Chinese, the teachers still teach as if they were teaching Chinese students. Why? Isn’t it obvious to every teacher that you have to adjust your pace according to the level of your subject students? So it’s no surprise at all that the Chinese teachers were struggling in managing the classes in the 2nd week. What else do you expect? What do you expect if you send these Chinese teachers to Mars and ask them to teach alien students? You may think that I’m exaggerating the difficulties the language barrier and cultural difference posed to the Chinese teachers. I’m not. Culture is one’s frame of reference to judge the right from the wrong, to judge what is acceptable and what is not. I’ll use this analogue throughout this post. Language conveys culture. Culture spreads through language, both vertically from older generation to younger generation, and horizontally from one geographical area to another. Language also shapes culture, often in some very subtle but important ways. The 5 teachers speak decent English. However, it’s one thing to express oneself in English language, it’s another thing to fit in the context, know the protocols and have a English/British mindset. Several scenes in the video illustrated the cultural difference really well. I’ll present some of them in detail here. The students just listened and nodded and didn’t know how to continue the conversation. I can say from my experience that what Miss Li did is already a really soft touch by Chinese standard. 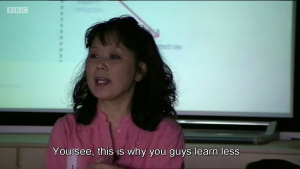 (I wish I had teachers like her when I was young.) She actually had thought it over before she talked to the students. Probably she tried to change a little bit to better get along with the students. But the students didn’t appreciate that either. The conversation would be more engaging and the students would probably behave differently. It means, beware of your backwardness, feel ashamed, and then get the courage out of the shame and humiliation. It’s out of this way of thinking, Miss Yang dropped the bomb to the whole class. This way of thinking is so common and so deep rooted in Chinese culture, that everyone takes it automatically that this humiliation is for the students good. Since Sophie wanted to explain why she was talking, and she rightly pointed out (from her frame of reference) that Miss Yang’s remark was a bit rude, I would say that’s a perfect opportunity to start engaging with her. Maybe Miss Yang can explain why did she said that, and Sophie can explain why is that not acceptable for British students. Then that will be one step forward in understanding each other. But Miss Yang insisted to talk to her later. From the video we don’t know whether they had deeper talk on this later or if so how did it develop. Compare to what Miss Yang had said, this is a much reserved comment. However, this is again, typical Chinese way of thinking. You’re not just yourself, you belong to a group. You should behave yourself in order not to make a bad impression of the group. This will not be taken seriously by the students, because to them, every individual represents that individual. If someone generalize his impression of an individual to a group, that’s simply wrong. Some students actually raised their hands. They though Miss Li is asking the class and would like someone to answer it. However, Miss Li was not. These kids probably felt rather confused or feel being ignored. In Chinese class, the point is to get knowledge delivered as quickly as possible. Interaction is not important. It’s common practice of teachers to ask some questions along lecturing, and then answer them immediately, as a way to get attention from the students, and avoid the trouble of interrupting the flow of delivery. I don’t think anyone of the British students is aware of this. In British schools, interaction is essential. The 2 kids must be very excited that finally Miss Li wants their participation. So they eagerly raised their arms, but only to found out that Miss Li is not interested at all. In the two episodes, this happen over and over again: Both parties tried to communicate with the other, but neither party knows the other party’s way of thinking. So both parties just felt frustrated and disappointed. In the program , I didn’t see much reflection from the students, probably because they are just teenagers. I did see teachers reflect on themselves. And here the saddest part: All the Chinese teachers agreed that they were facing difficulties in managing the class, but no one approached this issue from a language perspective or a cultural perspective. Instead, in the end, they seemed to agree that the students were not well behaved because Britain is a welfare state. That cannot be further from truth. Just see how the students behaved when the head of school was talking to them. Mr. Steward Vaughn is powerful, but I don’t think he has the power to change Britain into a non-welfare state. It’s the language and cultural difference at work!